August 31, 2011  Back before Texas Gov. 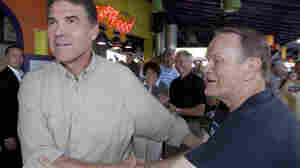 Rick Perry threw his hat in the presidential ring, he referred to Social Security as a "Ponzi scheme." His campaign had tried to distance the new candidate from that language, but last weekend Perry himself waded right back in. August 29, 2011  President Obama nominated Princeton University economist Alan Krueger to chair the White House Council of Economic Advisers. 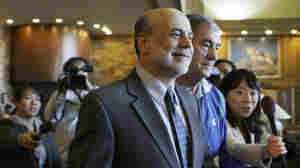 The appointment comes as Obama prepares to unveil a new jobs package. August 27, 2011  One of the challenges policymakers meeting in Wyoming this weekend are wrestling with is how to get control of the government's red ink without kicking the economy's wobbly legs out from under it. 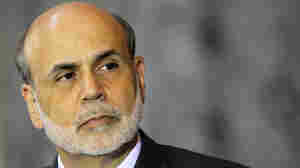 August 26, 2011  Federal Reserve Board Chairman Ben Bernanke addressed the annual economic symposium hosted by the Kansas City Federal Reserve Board in Jackson Hole Friday. The central bankers provide the Fed's evaluation of the national economic condition. August 26, 2011  On Wall Street, stocks fell at first on word that the Fed isn't likely to take any new steps to boost the economy. They later recovered. August 26, 2011  The Federal Reserve chairman delivers a much-anticipated speech Friday morning on additional steps the Fed might take to shore up the economy. Some investors are hoping for another round of quantitative easing, but others warn that a solution can ultimately only be worked out by the president and congressional Republicans. August 18, 2011  Prices and jobless numbers are up and the markets are down. Thursday, the president leaves for Martha's Vineyard with his approval ratings at record lows. What's his strategy for the economy this fall? August 18, 2011  President Obama is off to New England on Thursday afternoon for a family vacation. He returned to the White House Wednesday night after a three-day bus tour through the upper Midwest. The campaign-style trip produced little in the way of new ideas for boosting job growth. 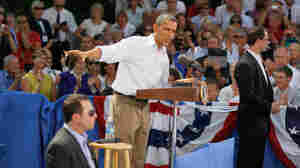 August 16, 2011  President Obama will host a forum on rural economic development in Iowa Tuesday. It's the middle stop on a three-day bus tour of the upper Midwest. As he talks about job growth, Obama is also testing out the themes that are likely to define his 2012 re-election campaign. August 15, 2011  After a weekend dominated by Republican White House hopefuls, President Obama hit the campaign trail Monday on a bus tour of the Midwest. August 2, 2011  The president wasted no time getting the debt deal signed after the Senate cleared it Tuesday afternoon. He may think it's a far cry from the far-reaching "grand bargain" he sought, but it was better than the prospect of default. August 1, 2011  The keys to the debt deal the president has made with congressional committees involve a new deficit-cutting super-committee of 12 members of Congress — and a draconian mechanism to cut spending if the 12 cannot.